Marv might be tough, but we'll bet that still stung. 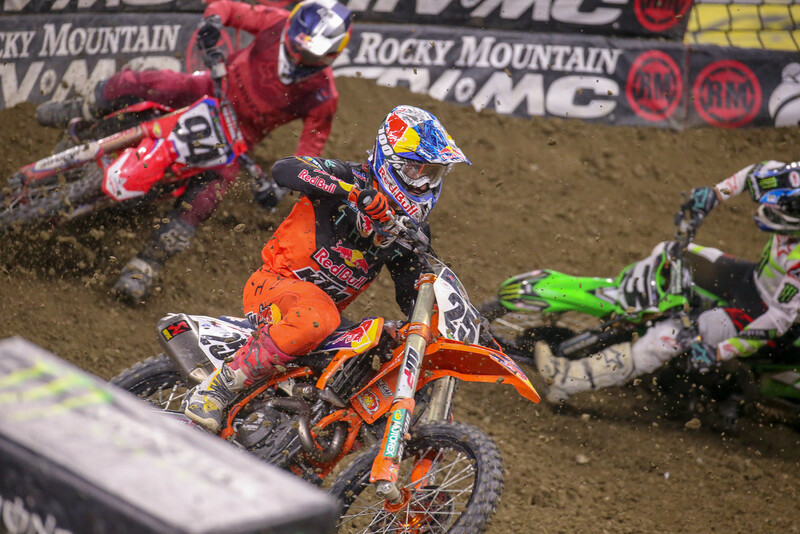 Seeing Marvin Musquin hold tough and get that elusive first win of the 2019 Monster Energy Supercross season has me wondering why he doesn’t get more respect. Since 2017, Marvin has been a serious contender for the Monster Energy Supercross Championship, yet he is often overlooked. I was talking with a casual fan and he assured me Eli Tomac would surely make a run at the 2019 championship. His evidence being the 2018 Monster Energy Cup where Tomac won all three main events and collected the one million dollars. Did everyone forget Marvin accomplished that same task the year before? In addition, Marvin completed the task without the help of a teammate. Marvin trains at the Baker's Factory alongside Red Bull KTM teammate Cooper Webb. Heading into the season Marvin was considered the number one guy and unlike Webb, he was expected to challenge for the championship. An offseason knee injury left Marvin unprepared heading into the 2019 season. His results were good but not what we have come to expect from a title contender. As soon as Webb started winning, public perception of Marvin turned quickly. Somehow everyone decided he was once again the number two guy at Aldon's place. Ryan Dungey was the guy in 2017, and Jason Anderson took the position in 2018, but Marvin would surely be the guy in 2019, right? Most people, myself included, thought Webb was the guy and wondered if Marvin would crumble under the pressure and criticism. I went as far as asking him how he kept from getting frustrated watching his training partners consistently in front of him at the Dallas post-race press conference (at 19 minutes in the video below). Marvin, the consummate professional, explained that he didn’t have high expectations heading into the season because of the knee injury. One thing I respect about Marvin is he will answer the hard questions without getting mad or giving specifically vague answers. Marvin does the opposite, he answers the question and much more. I appreciate his openness in an era of answering questions in clichés. He's a breath of fresh air and he doesn’t hide behind sponsor reads. Marvin and his wife are some of the nicest people in the sport, but he is consistently booed and vilified. Is this because he is French or because his primary rival, Eli Tomac, is affectionately referred to as “Captain America?” I still hear fans telling me his move on Eli in Foxborough 2018 was dirty. It might have been, but the hatred spewed at Marvin didn’t fit the crime. If the roles were reversed, Eli would have been celebrated for the pass. Marvin is quietly one of the toughest and mentally unshakeable racers I have ever seen. 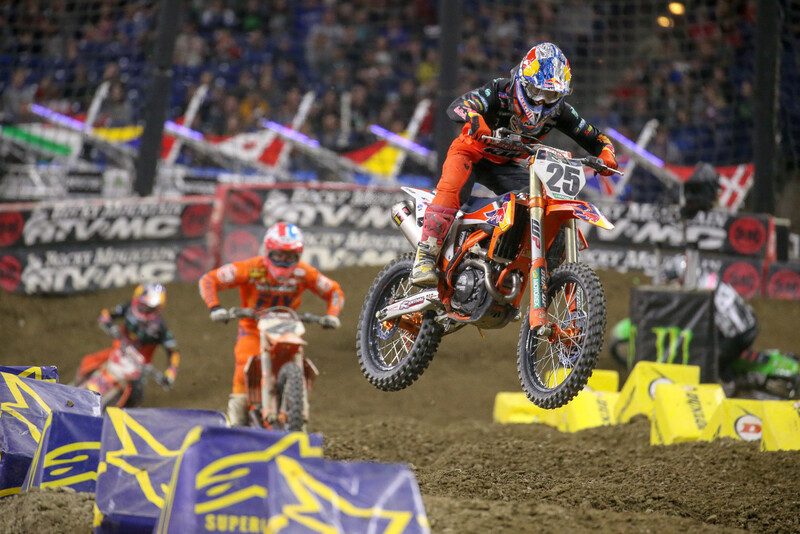 In 2018, Marvin fought through a dislocated shoulder to get back into Supercross Championship contention. In 2017 Marvin fought through a severe knee injury to push Eli Tomac to the last round of the outdoor motocross championship. He could have taken the easy way out in both situations, but instead Marvin fought through the pain and gave himself a chance to win the titles. This kind of mental strength is rare and I believe if Marvin was from the United States instead of France, he would be recognized for his attributes. Marvin’s biggest on-track weakness has always been the whoops, and he has become a master of jumping through them. Even with his jumping skills, Marvin hired brutally honest rider coach David Vuillemin to help him improve his whoop skimming, among other things. Anyone who works with Vuillemin must be mentally strong as he will surely break their spirit. Vuillemin doesn’t sugarcoat his advice even a little. If Marvin can fight back and win the 2019 championship this will surely be one of the greatest stories of perseverance in Supercross history. There is a lot of time left in the season and this is only one win, but the win shows his character. Don’t let his soft demeanor fool you, Marvin is one of the toughest racers I have ever seen. He will always fight, even when his competitors appear to have the upper hand, he never surrenders. Follow me @chriscooksey61 on Instagram and Twitter and @Cookseymedia on Facebook. Chris Cooksey is life-long motocross enthusiast, racing professionally in arenacross, motocross and supermoto. Chris obtained his degree from Arizona State, majoring in business and communications. After college Chris immersed himself in the business and social media aspects of the industry. Chris enjoys sharing his opinions. Sit back and enjoy the view from his perspective. always like Marvin and his wife!!. I always wonder will he return to France when his racing is done, or remain Here in the USA...Great riding Marv …. I've been an on/off fan of Marv for year's. Honestly, I hope he wins the SX Championship to lay claim that he's #1 at KTM. People talk about some of the guys like Ryan Hughes who always fought hard, Marvin is the same on track. Off Track Hughes and Marvin couldn’t be more different.